Sully “Salvatore” Erna of Godsmack may know how to play poker, or at the very least, is good at being lucky. After being just a few blinds away from hitting the rail on Day 3, Sully is now stacked at 60k at the end of level one. 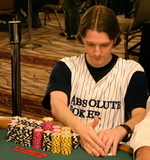 We first reported on Sully’s poker exploits back in April when he was the crowd favorite at the 2006 Foxwoods Poker Classic, only to flame out after being up to 50k, which we’re betting will happen today. Regardless of what happens though, Sully can walk away today standing (short and) proud, knowing that he outlasted more than 7,000 others. Vaughn “Project Dirtbag” Sandman, who is sitting next to 2005 WSOP champ Joe Hachem was stacked at 200k the last time we checked in with him. He said his table is full of Party Poker qualifiers who are kissing Hachem’s Aussie arse, gladly handing over their chips without much of a fight. While Sandman clearly respects Hachem’s play, he isn’t showing much deference to the defending champ. Sitting to Sandman’s right, Hachem bet into Sandman 14k on one hand, and as Sandman thought about it Hachem remarked, “I’ll discount it for you,” as he took back 4k from his bet. Sandman quickly replied, “Put it back,” letting Hachem know he’s here to play poker, not to be charmed, as the rest of the table seems to be. During the break, we ran into Tyler Pendleton (left), who we first introduced you to the other day. He’s now at 230k. Phil Ivey can’t seem to get much traction or respect after doubling up early on. We saw Ivey get bluffed off a big hand by John “The Show” O’Neill the last time we walked by, which Pauly at Tao of Poker reported on in detail. Read about it here. Chris “Jesus” Ferguson by the way has busted out. Shortstacked in the small blind, Jesus went all in for 14,500 with 10-6 off. UTG called with A-8 and hit a flop of A-J-5 rainbow. Turn K. River 5. Josh Arieh, who fought back on Day 2 to 86k while seated next to Joanna Krupa, has just been eliminated. Also eliminated is Absolute Poker pro Casey Kastle, who is not to be confused with Absolute Poker pro Lacey Jones, because he’s not a hot blonde model/actress, or with Absolute Poker pro, The Grinder, because he’s not a machine. For most up-to-date eliminations, visit Tao of Poker.